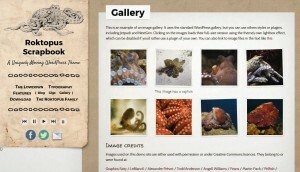 Hai Media Group is pleased to be supporting a new beta phase effort for Roktopus Scrapbook! If you are a web developer, designer or DIY maker, and would like to participate in the beta test phase, please get in touch with us. Contact details are below. Roktopus Scrapbook is a new WordPress theme that will debut with a full commercial release in 2016. We think that for the web design world this is going to be the most recklessly skeuomorphic new WordPress theme of 2016. With original “helicopter navigation” viewpoint, rewriting the rulebook on how websites are laid out, Roktopus Scrapbook offers a new way for your website to stand out from the crowd. Other features include an in-built music player, allowing for uninterrupted playback as you navigate – ideal for musicians and bands. Roktopus Scrapbook contains six skins, with literally millions of permutations possible, and allows easy set-up for any photos, custom backgrounds, blog entries and tour date pages. Coming to Creative Market in 2016, our beta phase opportunity will let you get a sneak peak at this exciting new WordPress theme before it hits the market. 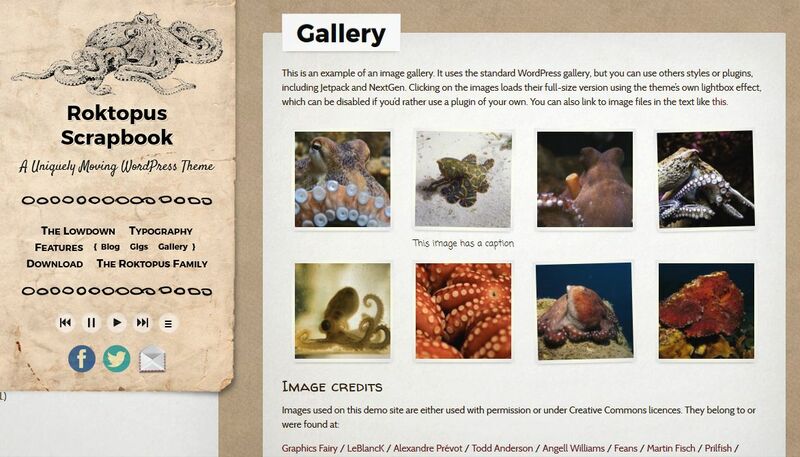 And, by participating in helping Roktopus Scrapbook test out the new WordPress theme, you will get a FREE copy of this product that is valued at $75, as soon as it’s released. So how do you get involved? Easy. Please just send an email to [email protected] and put HAI BETA: Roktopus Scrapbook in the subject line. We’ll get back to you with further instructions. *Please note that we have a limited number of beta testing opportunities available for this, so get in touch today.